Northern Ireland was rocked by violent conflict from 1968 to 1998 and over 3,600 people lost their lives. An even larger number were injured, perhaps as many as 100,000 people. It was the job of the Northern Ireland Health Service to treat these patients, as well as to continue to provide medical care to the wider population. During the 1960s, the NHS was not prepared for or anticipating a serious long-term violent conflict. Planning carried out prior to the period had considered the threats posed by accidents in transport and industry, as well as the dangers of natural hazards such as flooding. The onset of violence in the late sixties therefore severely tested the service. The effects of the conflict were quickly felt by medical staff. A controversial Loyalist Apprentice Boys' march in Derry on August 12th 1969 led to two days of rioting. Staff working in casualty at Altnagelvin hospital in Derry described how they felt unprepared for the injuries they saw. One nurse explained that, prior to the violence, they had had an easy time working in casualty, which would often be staffed by only student nurses. Serious incidents also took their toll on the staff working at this hospital. Following a march on January 30th 1972 protesting at the introduction of internment, the British army opened fire in the Bogside area of the city. 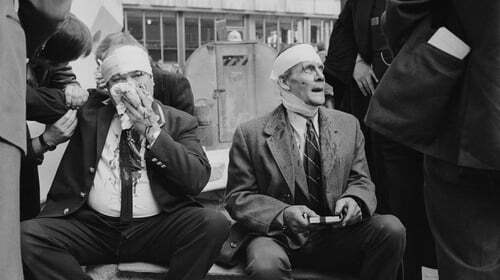 13 people were killed, and more wounded in this controversial incident, known as Bloody Sunday. A group of nurses who were present at the hospital on that day spoke of how they felt wholly unprepared for what they experienced. One staff member who had attended the march described arriving back at the hospital: "I went in through casualty and there was total chaos, patients standing, sitting and nobody seemed to organise." Hospitals in Belfast were similarly put to the test in August 1969. Staff working within casualty at the Royal Victoria described this period as "absolutely hectic" and "exhausting", perhaps unsurprisingly as statistics collected by the A&E consultant show that 56 were treated for violence related injuries on August 2nd and 115 on August 15th. Numbers were not the only issue. The Troubles saw many injuries which medical staff had previously little or no experience of dealing with. Both high and low velocity gunshots each created their own distinct injuries. Bomb blasts led to a wide range of injuries such as blast lung, hearing loss, burns, direct injuries, and wound contamination. Some of the staff involved explained that they felt unprepared for the injuries they saw, but that they learnt so much and developed expertise, particularly in the treatment of trauma during the period. "We had a horrific time", said one casualty nurse, "but it was a wonderful time to work, and we met fantastic people and we learned so much." Alongside the problems associated with types of injury and the sheer numbers of casualties’ major incidents or rioting could bring, staff also had to deal with the emotional effects of working in a conflict zone. Some have personally struggled with the things that they lived through and witnessed. "Some things were too horrible to be forgettable", said one doctor, "and even today, talking about, even thinking about them makes me cry and brings on the tears. I still waken during the night with terrible dreams about those days." A nurse explained how they had become so accustomed to the violence and bloodshed that in their mind it was normal. It was only when looking back from the present day that they realised just how abnormal and horrific the situation had been. Staff also faced real physical dangers during this time, even within the confines of the hospital. A surgeon in the Royal had a gun pointed at his chest in a case of mistaken identity before it was turned on his friend next to him, who was shot twice and who unfortunately did not survive his wounds. On more than one occasion, bullets went through the nurses’ accommodation at hospitals in Belfast including Musgrave Park and the Royal. Bombs and bomb scares at various hospitals caused disruption to patients and staff. Sadly, several medical staff also fell victim to the conflict. Janet Bereen, a radiographer from the Royal, died in the Abercorn restuarant bombing in 1972,. Her father, an anaesthetist at the hospital, was on duty and helped with the treatment of the injured, not knowing that his own daughter had been killed. Gerald Tucker, a mortuary attendant, was killed on hospital grounds in 1977. In October 1980, Robin Shields, an ambulance controller was tragically shot and killed while at work. During a Remembrance Day service in Enniskillen, Co Fermanagh on November 8th 1987, the IRA exploded a bomb which killed 11 people, including a nurse, Marie Wilson. Staff across Northern Ireland faced many difficult and often dangerous days during the conflict. However, they built strong bonds with colleagues, supported one another, provided the best care they could to their patients, and learned from the experiences for the benefits of others.